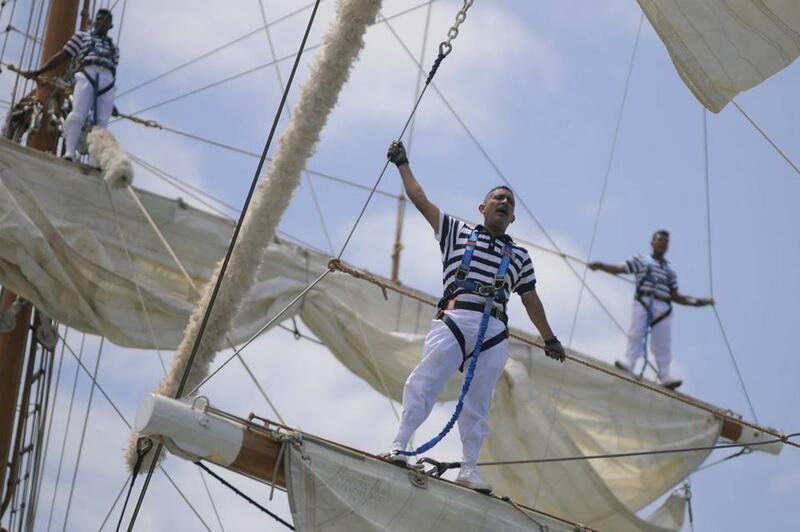 Sailors of the Mexican Army&apos;s training ship Cuauhtémoc stood on the mast of the ship as it arrived in Panama City last month as part of its world tour. The Cuauhtémoc, a nearly 300-foot, three-masted barque was scheduled to dock at Fan Pier on Wednesday as part of a nearly yearlong trip to 12 countries. The ship changed its schedule in advance of a storm that could bring high winds and drop more than a foot of snow on the city. “In light of what’s coming [Tuesday], we wanted to get to port safely,” said Robin Reibel, spokeswoman for Sail Boston, which organized the visit. The Cuauhtémoc is coming to Boston as part of the buildup to Sail Boston, an event in which more than 50 tall ships will be in Boston Harbor from June 17-22 during the Rendez-Vous 2017 Tall Ships Regatta, according to Reibel. While the Cuauhtémoc is not part of the summer event, this week’s visit will provide residents with an early taste of the celebration, Reibel said. “These are really great, unique ships. We’re expecting millions of visitors coming to see them so this is a nice little sneak preview of what June will be like,” said Reibel. The ship will remain in Boston until next Monday, when it will depart for Huelva, Spain, Reibel said. The public will be allowed to board the Cuauhtémoc from 11 a.m. to 4 p.m. on Wednesday and 10 a.m. to 8 p.m. Thursday through Sunday.